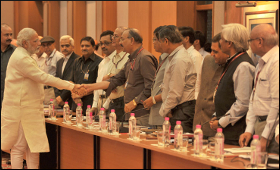 Prime Minister Narendra Modi on Tuesday held a high-level meeting with key officials from the Finance Ministry to review the preparedness to roll out the Goods and Services Tax (GST). According to highly placed sources, Prime Minister Modi met Finance Minister Arun Jaitley and senior officials from the Revenue Department including Revenue Secretary Hasmukh Adhia to review the progress on the GST roll-out, among other issues. The government is looking at July 1 as the date for the GST roll-out - marking the biggest indirect tax reform since Independence. A number of multilateral and ratings agency have predicted that the GST will boost India's growth in the medium-term. Apart from GST roll-out preparations, the high-level meet is understood to have discussed progress on the central government's anti-black money measures. GST rule is still silent about export documentation procedure. At present rule of excise exporter is wasting lot off time for physical visit at excise office for taking signature in various documents for export like ARE1,ARE3A and for executing procedure for various bond lie CT3,CT1,UT1 for export. All should eliminate for ease to doing business.Not to have single physical interface with departmental officer.